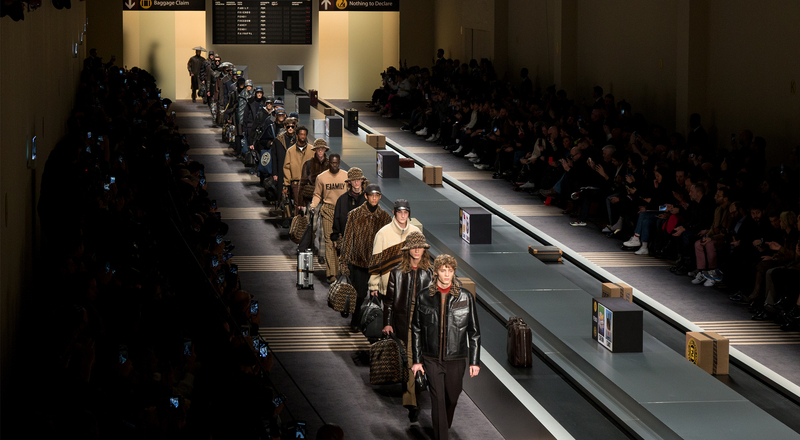 With Fendi showing in Milan and Dior Homme, Louis Vuitton, Berluti, Kenzo and Loewe in Paris, LVMH fashion houses showed their looks for men for next winter. Highlights from Fall/Winter 2018-19 Men’s Fashion Weeks. Travel inspired Fendi’s Fall/Winter 2018-19 collection, reinventing the Maison’s codes, the FF logo, stripes, Fendi yellow and the Fendi stamp. Silvia Venturini Fendi shared her vision of travel with reversible dual-purpose clothes to lighten the weight of bags. The clothes and shoes are designed for comfort with oversize blousons and intarsia pattern sweatshirts, rubberized parkas and glossy raincoats. Accessories resonated with the Fendi manifesto, marked with catchwords like “Family”, “Freedom” and “Fancy”. The collection sent out by Kris Van Assche set the sartorial finesse of the Dior Homme against urban nostalgia. The Creative Director for Dior menswear provoked an evolution of formal codes, deconstructing the Dior Homme suit and introducing a tattoo motif as a heraldic device or all-over print. Knit polo shirts, tank tops and turtleneck sweaters came in forest green, crimson and safety yellow, paired with structured trench and overcoats in bonded cashmere. Laser-printed tattoo brogues and canvas hi-tops drove the streetwear/tailoring contrast, reflecting the eternal duality between youth and manhood. For his last runway show as Creative Director of Louis Vuitton menswear, Kim Jones chose travel as the red thread for the collection. Prints on shirts, raincoats and leggings were taken from photos shot during a helicopter flight across Kenya. Technical details and neon colors are drawn from the world of climbing, and hybrid styles collage elements for cowboy and hiking boots. The Monogram is revisited in accessories with titanium and glaze finishes on bags and shoes. The collection reflects a contemporary lifestyle and celebrates the Maison’s ever-evolving point of view. In a surprise finale, Naomi Campbell and Kate Moss took to the runway in Monogram trench coats flanking Kim Jones for his last show. Hidden details and artisanal know-how shined throughout the collection created by Haider Ackermann, Creative Director of Berluti. Pure lines elevated pieces inspired by the Alessandro shoe, including nylon windbreakers crafted from a single piece of fabric, or leather coats with invisible seams. Silhouettes are round at the shoulders and slender at the legs, as tailoring forgoes shoulder pads for a relaxed look, and hand-cut velvet gives an artisanal touch to trousers and suits. Accessories feature bags assembled from two pieces of calf leather and a new shoe, the Alessandro 0 Cut, an entirely seamless exercise in Berluti bootmaking know-how. The color palette is white, black and camel with pops of olive, sky blue, orange and purple. 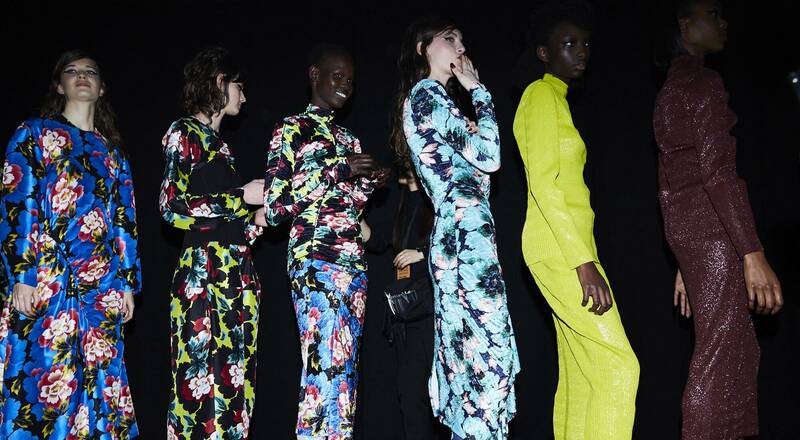 The Fall/Winter 2018 Women’s and Men’s collections by Kenzo Creative Directors Carol Lim and Humberto Leon pay tribute to inspirational figures from the cinema who inspired previous collections. Boxy men’s silhouettes are set off by skinny pants in the full gamut of fabrics. Reflective fabrics are used on technical nylon vests or trousers, and zip-up nylon blousons with floral jacquards partner with wool molleton. The women’s looks feature cherry blossom silk satin jacquard dresses worn alongside modernized twinsets in transparent nylon knits, as well as silk pencil skirts. Micro-pleated velvet dresses and skirts in archival floral prints are joined by tweed cargo pants and washed cotton canvas inspired directly by films. Contrasting with the black and white tone of photographic sequences by photographer Duane Michals to accompany the collection, the clothes draw upon a restrained masculinity. The different pieces are refined through the Loewe lens of craft and material development, as new leather finishes create burnished patinas and a corduroy effect. Outerwear shapes are crafted in fine shearlings and Melton wool checks; rugby lacing and a Loewe varsity logo appear as timeless boyish motifs.